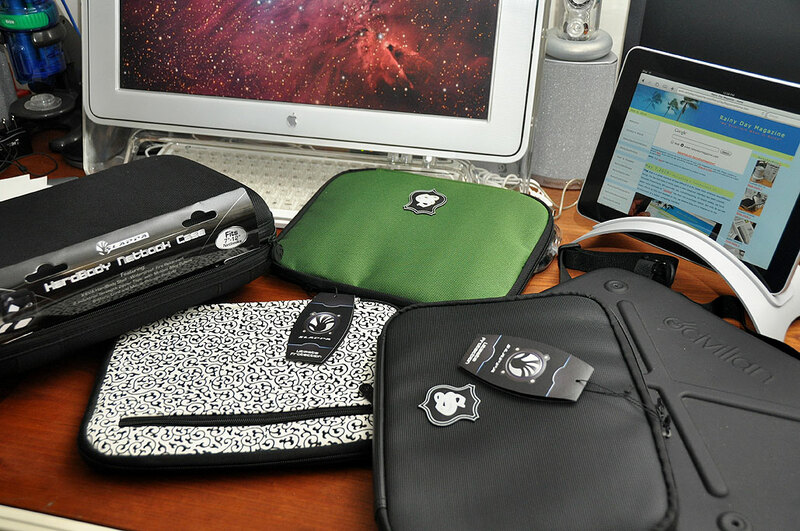 An iPad cover is one accessory that many new owners are probably considering for their newly acquired tablet. A few weeks back we showed readers how to get by with what they already had around the office, including how to make a cover out of an old composition notebook. Today we’ll take a look at a few commercially available options for the less DIY-inclined. There are a LOT of iPad covers on the market. We are going to cover a few general ones in this write-up. It will be basic enough to serve as a guideline for evaluation covers for different needs. We’ll continue to review specific covers when we find ones which are unique, innovative, or in some way worthy of consideration. We look for three things in an iPad cover: the kind of protection it offers, whether it makes the iPad easier to carry/transport, and if it has any feature that makes the iPad easier/more comfortable to use. First up are the basic covers. They offer padded protection for iPads while in transit. These covers should be light, slim enough to fit into a backpack or briefcase, and allow quick access and easy removal of the iPad. One case which fits the bill are the sleeves from Slappa. Slappa sleeves have a nylon outer shell that shields against moisture, an outside pocket for cords and such, and is well-padded for all around protection. The sleeves also come in a variety of colors and textures for those whose style extends beyond basic black. For readers with a need to carry a bit more than just their iPad, the Slappa Hardbody M.X. should fit the bill. The case’s outer shell is molded using Slappa’s xEVA material. The Duro-Shock xEVA material is superior to other materials in that it is waterproof, fire retardant, and provides excellent protection against drops and bumps. There are three pockets for cords, plugs, and other miscellaneous accessories. This case is a bit bulkier, though, and will not fit into most briefcases. 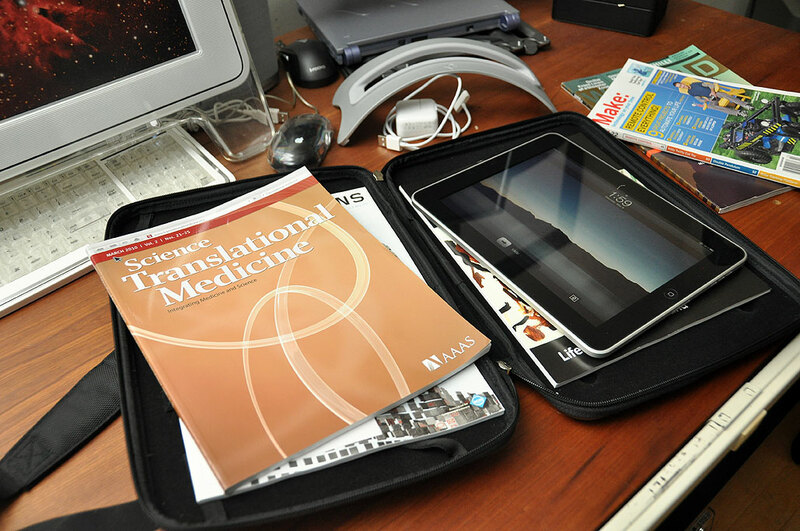 It is an excellent transport case, but is not suited as a primary case for the iPad as it does not have a handle or a shoulder strap. Get the Hardbody M.X. if you need to stow the iPad for some rough outings and want to make sure it survives the trip. Next up is a case from a small company Long Beach, California, called Civilian Lab. It is an unusual company and not all that well-known outside of a group discerning customers. However, we expect their name and reputation will spread as more folks learn what they have to offer. We happened upon them in 2008 when researching harness systems for a “special project” back in the day. They had exactly what we were looking for. 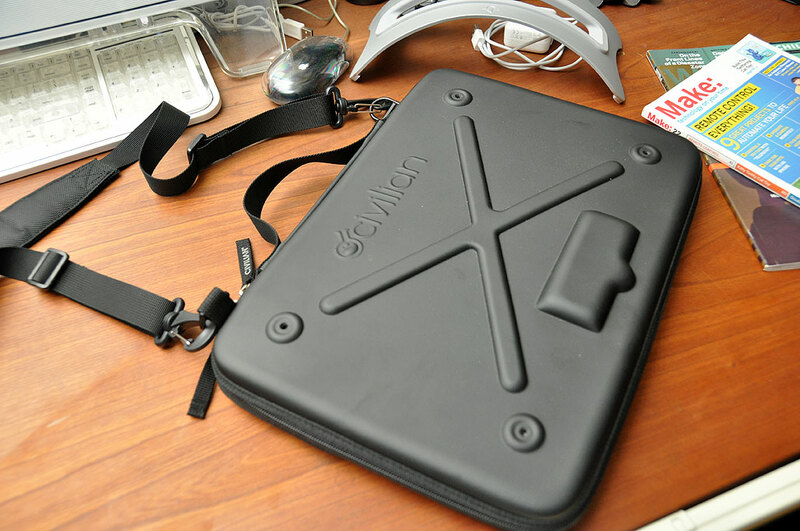 In poking around Civilian Lab’s site, we also found a very interesting slim laptop case called the Radiator which was like nothing else we had seen before. Integrated into the case was a very funky suction cup laptop anchoring system. It was an interesting way to secure a laptop, but none of our laptops were the right size so we never got to use it. Fortunately, the suction cups were easily removable and the case was just as useful without them. When we got the iPad, we realized the Civilian Lab Radiator case was an excellent carrier for it. It was highly portable, very sleek, and offered great protection. It was large enough to hold the iPad, a few magazines, and some accessories. It also had a very cool recess with a velcro cover which was perfectly sized for stowing a set of earphones. We have been using the Civilian Lab Radiator to carry our iPad since we got it on April 3rd. This is our everyday iPad case. The value/ease of typing on an iPad is something which is actively discussed on many forums. We have looked at both the virtual and physical keyboard options in past articles. We have also posted some of our general thoughts on the subject of user interfaces, specifically regarding keyboards and tablets. However we do realize that for the time being keyboards are the only practical option for text input. Since that is the case, we might as well look at some covers that make the task easier, which brings us to the Apple cover. The Apple case is a custom-sized folio for the iPad. The case is slim and should have no problems fitting into a briefcase or backpack. The padding of the case is minimal, but well placed. It does not have the carrying capacity of the Civilian Labs case or the funky designs of the Slappa covers, but it does have one feature which none of the other covers have: it can be folded up to form an angled stand to allow for more comfortable typing. The back of the Apple case has a flap which will catch the edge of the front cover when it is folded backwards, forming the wedge. The case will also stand upright when so configured. The case is made of some kind of synthetic rubber-like material, very form-fitting, and has custom openings for all of the iPad’s ports and buttons. The front cover is hard and will protect the screen from direct impact. All of the edges have a bead which will act as a shock absorber for the typical bumps and knocks. Getting the iPad into the case can be a bit difficult. It was not designed so the user can quickly slip the iPad in an out of the case. Once the iPad is in the case, the iPad is expected to stay there. The material used for this case is an absolute dust magnet. If you don’t like fingerprints, this cover may not be for you. We have looked at three different style of iPad covers this time around. Undoubtedly there will be more coming over the next several months as more companies get on this iPad bandwagon. If you see something particularly interesting, let us know. We’ll be happy to take a look and share the find with everybody.